Malin Head lies on the Inishowen Peninsula in County Donegal, at the most northerly tip of the island of Ireland. 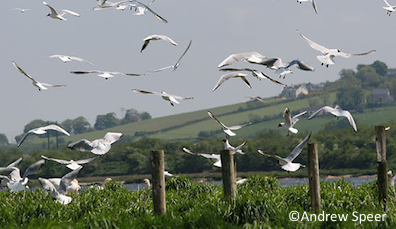 It is the start (or end, depending on your point of view) of the Wild Atlantic Way and has long been renowned for its epic coastal scenery, thriving birdlife and historical curiosities. 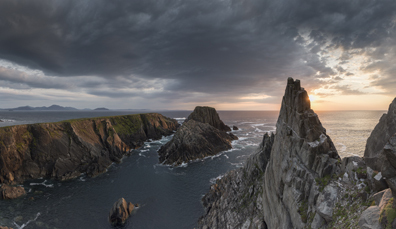 More recently, Malin Head so captured the imagination of Star Wars location scouts that they cast it in Star Wars: The Last Jedi. Locals and visitors alike were thrilled by the sights that unfolded over the course of the shoot. The Millennium Falcon (ok, maybe it was a replica) perched on a cliff as the waves crashed beneath it; Luke Skywalker (actor Mark Hamill) popping into Farren's pub on Malin Head for refreshments; a local stormtrooper arriving to the set in full battle dress. The crew did as everyone should along the Wild Atlantic Way – they left no trace behind them. Now, when you visit Malin Head, you'll just see the unspoiled beauty of the place. A great place to start exploring Malin Head is the very tip of the headland where you'll find Banba’s Crown (named after a mythical goddess of Ireland). "The Tower", as it’s known locally, was built by the British Admiralty in 1805 as part of a string of buildings right around the Irish coast to guard against a possible French invasion. More modest are the nearby World War II lookout posts. Malin Head was one of 83 coastal locations used to provide a picture of wartime events along the Irish coastline. The coast watchers here had plenty to report in the early stages of the war as German U-boats attacked convoys in the vicinity. Explore the remains of this stunning stone ring fort at Burt. 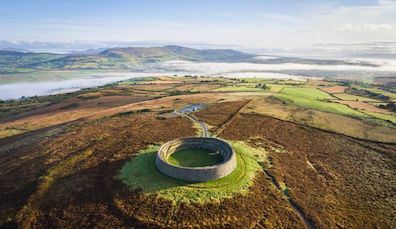 It’s built on the site of the original 1700BC ring fort, and stands 250m/820ft above sea level. On a clear day, you can see no less than six surrounding counties. Take a boat tour from picturesque Bunagee Pier and you could see a thrilling range of marine wildlife, including seals, sea birds... maybe even a dolphin, if you're lucky. And the views will make your heart sing! Follow the 8km looped walk around this wetland and you’re in for a birdwatching treat. Watch out for geese, swans, ducks and a variety of waders as well as panoramic views of the landscape. Overall, the turbulent waters off Malin Head have witnessed more than their share of maritime history. 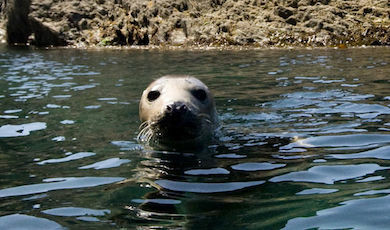 The folks at Mevagh Dive Centre can tell you that there are more ocean liners and German U-boats sunk off this stretch of coast than anywhere else in the world. Several miles off the coast of Malin Head lies Inishtrahull island, composed of the oldest rock in Ireland, metamorphic gneiss dated at around 1.7 billion years old! Further to the east, the hills of Scotland can be seen on a good day. Also in view just along the coast from Banba’s Crown is Ballyhillin Beach, a unique raised beach system of international scientific significance. It’s a reminder of a time, 15,000 years ago, when sea level was up to 30m/100ft higher than today. The beach is also well-known for its semi-precious stones. Finally, one of the world’s most amazing natural phenomena has started to make regular appearances off the Inishowen Peninsula. 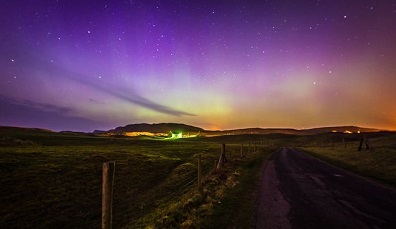 Thanks to a peak in the sun’s activity, the Northern Lights (Aurora Borealis) are frequently spotted off this coast. This is set to go on for a few more years, too, so maybe you’ll be in luck when you visit. So there you have it, the Inishowen experience: exhilarating coastal walks, unsurpassed natural beauty, spectacular phenomena and historical intrigue… take it all in before heading back on your Wild Atlantic Way adventure! Rugged, remote and unforgettable: weave your way around the Wild Atlantic Way's most northerly points. These photographers share their favorite images of the Northern Lights as they light up the night skies. 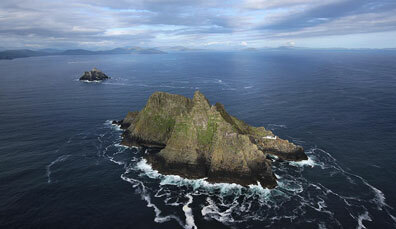 The makers of Star Wars didn’t have to travel to a galaxy far, far away to discover the Wild Atlantic Way.